David Cotterill's curling free-kick helped Birmingham claim a share of the spoils in an evenly-matched game with Championship rivals Fulham. 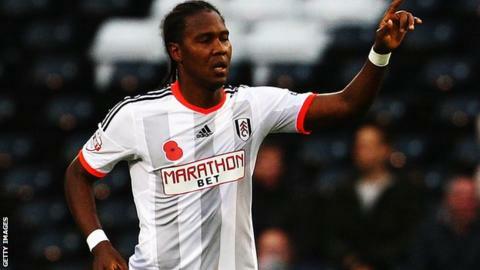 Fulham's Hugo Rodallega opened the scoring at Craven Cottage after five minutes with a well-taken strike to claim his 11th goal of the season. But the Blues were on level terms nine minutes later when Cotterill's free-kick nestled in the top corner. The draw does little for either side's slim hopes of reaching the play-offs. Gary Rowett's Birmingham are in 11th place on 38 points, while Fulham are three points behind in 16th - 15 points behind Watford, who occupy the final play-off spot. Fulham started quickly and, when Rodallega converted from Lasse Vigen Christensen's through ball, looked set to push on. But Birmingham, unbeaten in their last five away games, fought back. Cotterill's free-kick from the left caught Fulham cold and, with the scores level, Blues were the brighter team. Fulham, who won the reverse fixture 2-1 at St Andrews in September, fought back after the break and could have snatched a late winner, but Blues' keeper Darren Randolph was equal to Rodallega's powerful near-post effort. "The play-offs are an awful long way away and every time we drop points it gets that little bit further. "Tuesday away at Bolton is now a big game for us. I think this side is capable of going on a run and that could get us closer to the play-offs. "We started very brightly but it was almost a case of scoring too soon. It was a very good goal but we stepped back a little bit. "The second half we started a bit slow but then dominated from there. In the end we are disappointed that we have not gone on and won it." "The first half we started a bit slow and conceded the goal which obviously we are disappointed with. But we showed brilliant character to get back in the game with a great piece of quality from David Cotterill, which he does so often. "I think from there on in we were by far the better team. We counter attacked with real verve and pace and quality and I think we had five clear chances. "As an attacking force that is as well as we have played." Match ends, Fulham 1, Birmingham City 1. Second Half ends, Fulham 1, Birmingham City 1. Corner, Fulham. Conceded by Callum Reilly. Corner, Fulham. Conceded by Darren Randolph. Attempt saved. Hugo Rodallega (Fulham) right footed shot from the centre of the box is saved in the bottom right corner. Assisted by Ross McCormack. Attempt blocked. Alexander Kacaniklic (Fulham) left footed shot from the right side of the box is blocked. Substitution, Birmingham City. Callum Reilly replaces Lloyd Dyer. Delay in match Hugo Rodallega (Fulham) because of an injury. Attempt missed. Ross McCormack (Fulham) right footed shot from outside the box misses to the left. Assisted by Patrick Roberts. Attempt saved. Hugo Rodallega (Fulham) right footed shot from the right side of the box is saved in the bottom right corner. Assisted by Alexander Kacaniklic. Substitution, Birmingham City. Nikola Zigic replaces Clayton Donaldson. Attempt missed. Paul Robinson (Birmingham City) header from the left side of the six yard box is close, but misses to the left. Assisted by Demarai Gray with a cross following a corner. Attempt blocked. Paul Robinson (Birmingham City) left footed shot from the centre of the box is blocked. Assisted by Jonathan Grounds with a headed pass. Corner, Birmingham City. Conceded by Ryan Tunnicliffe. Corner, Birmingham City. Conceded by Shaun Hutchinson. Substitution, Fulham. Patrick Roberts replaces Lasse Vigen Christensen. Attempt blocked. Alexander Kacaniklic (Fulham) left footed shot from outside the box is blocked. Assisted by Ryan Tunnicliffe. Substitution, Birmingham City. Demarai Gray replaces Andrew Shinnie. Corner, Birmingham City. Conceded by Ashley Richards. Attempt missed. Seko Fofana (Fulham) right footed shot from outside the box is close, but misses to the right. Assisted by Alexander Kacaniklic. Attempt saved. Andrew Shinnie (Birmingham City) right footed shot from outside the box is saved in the centre of the goal. Attempt missed. Alexander Kacaniklic (Fulham) left footed shot from outside the box misses to the left. Assisted by Lasse Vigen Christensen. Attempt missed. Seko Fofana (Fulham) right footed shot from the left side of the box misses to the right. Assisted by Hugo Rodallega. Attempt saved. Hugo Rodallega (Fulham) right footed shot from the right side of the box is saved in the top right corner. Assisted by Ashley Richards.